It is a universally accepted truth that the greatest sports film of all time is “Rocky”. The story of a plucky underdog who overcomes great obstacles to achieve a shot at the big time and on the way enthralls an entire community. But if anyone ever commits the events of Monday 5th May 2008 to celluloid then there may be a new contender for that crown. Because this wasn’t just the story of a football tournament, this was the story of a team who discovered their true selves, a team whose time had come, a team who can now look the Amyands, the Good Shepherd Missions and the Chinese Churches of the world in the eye and say “we’ve been there too”. This is the story of N1 Invaders. Before we get to the day itself we must first glance back to a year ago to put the feat into its proper perspective. Although many would prefer to forget that tournament you and I, dear reader, both know the importance of the backstory so let us cast our mind back to 2007. Back then Invaders had gone crashing out in the first round without a win, or even a goal, to their credit. Fingers were pointed, blame was attributed and many felt this could be the end of the road for N1 Invaders. There were calls for their manager, Mawhinney, to go. Many thought there were too many players the wrong side of thirty and demanded new signings. And, worst of all, fans were deserting Invaders in droves for their arch-rivals, the Incredibles. So, leaping back again to 2008, things seemed hopeless for Invaders and few thought they would even qualify from their “group-of-death”. Written off as no-hopers? Thought to be past their best? Fans just hoping that Invaders wouldn’t embarrass themselves too much against the big boys? The prologue was well and truly written. But one man still believed and that man was Mawhinney. Before the tournament he was telling anyone would listen that this could be Invaders’ year, that this year they could win the Plate. Unfortunately for him there were not many left who were still listening and those that did just nodded sympathetically and smiled politely. But if they had have looked into his eyes they wouldn’t have seen the mad glint they were expecting but rather they would have seen a fire. Because Mawhinney still had the desire to win burning brightly inside of him and so did the rest of the team. Invaders had not just gone away and licked their wounds after last year’s debacle, instead they had looked deep inside and emerged stronger than ever. They built on the nucleus of last year’s vanquished team and strengthened it with several new signings. They had re-discovered the winning mentality in a number of pre-tournament sparring matches. And soon they were about to instil that same belief in a whole new generation of supporters. But let us not get ahead of ourselves. While you, the reader, may already be on the “redemption” section of the script our story is still very much in its infancy. When N1 Invaders kicked off their tournament they did so not on the show pitches but rather tucked away on Pitch 8, far away from the hustle and bustle of the hospitality tent. And they were cheered on not by the vocal crowds that would do so much to endear N1 Invaders to the neutrals later in the day but rather by a mere handful of die-hard fans. If Invaders were going to turn themselves into the heroes of the piece they were going to have to do it the hard way. The early results did little to suggest that this was going to be an epic with Invaders’ first three matches resulting in two draws and a loss. In fact many reporters were already beginning to write their epitaphs for N1, penning words about these gallant losers, saying that at least they tried and adding a few platitudes to compliment the hosts. But those who were actually there watching the matches had a different angle on the story. Although they hadn’t yet won a match they could see a side that was finding its feet, a side that was starting to gel, a side that just needed a win to kick-start its tournament. And that’s when it happened. That’s when Invaders began to make their presence felt. 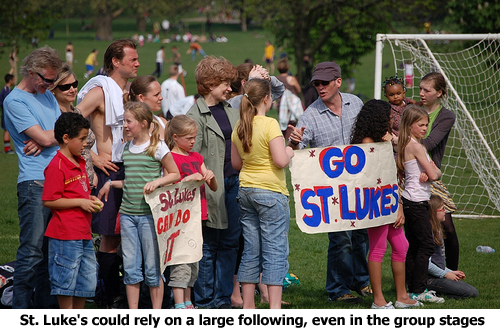 In their fourth match N1 were facing St. Luke’s who had both the crowds and the smart money on their side. Top of the group and yet to concede a goal, St. Luke’s were the clear favourites to get the win they needed to take them into the next round, but with a perfect sense of dramatic timing Invaders stole the show. Who knows what it was that inspired them to such a performance? Perhaps it was the quality of the opposition that bought the best out of N1. Perhaps it was the large crowds, even though they were cheering for their opponents, that caused them to raise their game. Perhaps things just clicked. Whatever it was, this was the moment when the real N1 Invaders finally stood up. Up front the clever movement and scampering of first Phillimore and then Barrett was stretching the opposition’s defence to breaking point. 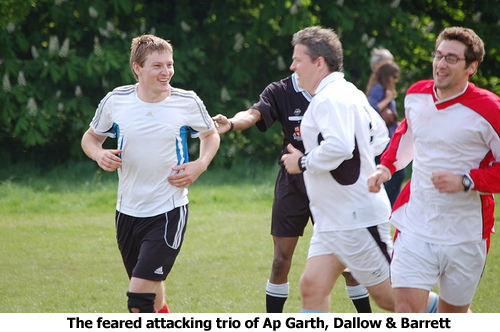 In midfield the link-up play between Dallow and Ap Garth had all but the most partisan fan cheering their every touch. On the wings Garnham and Burnham surged forward and back with the energy of men half their age. At the back Pike and Mawhinney were forming the sort of miserly defensive partnership that has been the hallmark of the great Invaders teams of yesteryear. And behind all of them was Blackmore in nets, the sort of insurance policy that Lloyd’s of London could only dream about. Invaders stamped their authority on the match early on with a fearsome strike from Ap Garth that put supporters in mind of, well, a young Ap Garth. From there on in N1 dominated the match and Dallow wrapped up the points with a coolly taken penalty in the dying minutes. The score was 2-0 to Invaders but the result was much more than that. This was the fillip that Invaders needed and now the players and the fans started to think maybe, just maybe. In the final match N1 obtained the draw they required to secure their passage into the knockout phases and the adventure was well and truly underway. Their record of just one win in the group stages may not have struck fear into hearts just yet but as an observer pointed out the great teams don’t peak at the start of the tournament, they save their best for the knockout rounds. And we were just starting to see the best of N1 Invaders. So now we come to the business end of the tournament. The time when it would take just one piece of skill or just one mistake to be cast as the hero or the villain of the piece. This would be when we found out what teams were truly made off. For N1 Invaders this meant going back to their roots, turning again to the tactic that had once made them “above average” – a strong defence and then hitting teams on the counter. And this system was employed perfectly against their second round opponents – St. Paul’s (Howell Hill). For the first few minutes Invaders weathered the storm with the waves of attack crashing against the defensive rocks of Pike, Mawhinney and Henderson. Then when the move broke down they hit back with the pace of Burnham and Ap Garth on the wing. And N1 got their reward midway through the match when Dallow picked up the ball just inside the opponents half, ghosted past the defenders and drilled the ball home. 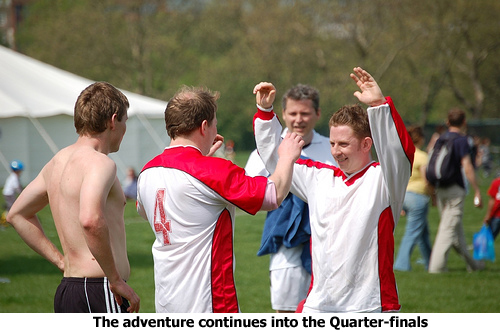 With the Quarter-final in sight N1 clung on doggedly to their lead and booked their place in the next round. This was now as far as Invaders had ever got and the team’s confidence was sky-high. Coupled to that, word was spreading throughout the park that something special was happening and the crowds swelled as the fans flocked to see this rags to riches story unfold. With both the supporters and the team on song surely nothing could stand in their way? Then the news came over the tannoy, N1 Invaders were going to play 3-time finalists Amyand in the quarters. A few months ago, perhaps even a few hours ago, Invaders heads might have gone down at the news but, metaphorically speaking, this wasn’t the same team that kicked off the morning. With the high-pitched roar of their fans behind them they took the game to Amyand from the off and soon found themselves in the lead. A beautiful series of quick 1-2 passes between Ap Garth and Barrett carved open Amyand’s defence and Ap Garth finished the move off to give Invaders one foot in the semis. But Amyand didn’t get to 3 finals by rolling over and giving up. They threw everything at Invaders’ goal and soon found their reward. Capitalising on a poor clearance they drilled the ball across the goal and it was tapped home from close range. 1-1 and if any team was going to win it from here it was Amyand. They continued to surge forward and it took a heroic effort from N1 to repel each attack. Invaders were definitely on the ropes and it seemed to be only a matter of time before Amyand finished them off. 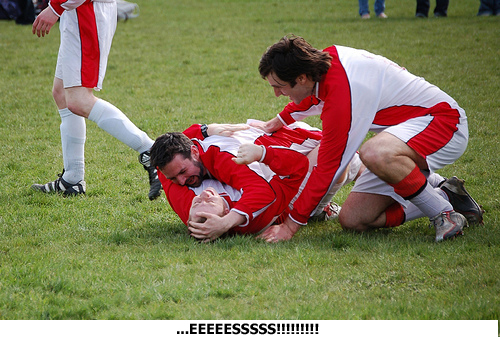 But, through a combination of luck, determination and sheer willpower, they hung on to the final whistle. Two great teams had pushed each other to the absolute limit and nothing could separate them. It would be down to penalties to determine who would go on to contest the rest of the tournament. And cometh the hour cometh the men. With the teams still even after the regulation 3 penalties it went to sudden death. Just 1 more kick each was going to determine who would stand and who would fall. The tension even rendered the normally vocal N1 fans speechless. 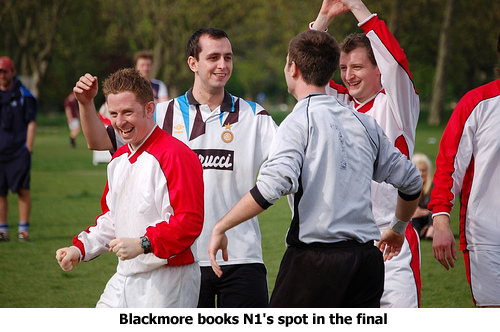 And in this cauldron of silence Blackmore took his position in nets to face the next Amyand penalty. The only noise was that of the ref’s whistle and then the thud of boot on ball. The kick was struck sweetly and the ball soared towards the net. A park held its breath. Then from stage left Blackmore’s outstretched glove appeared to deflect the ball wide. The crowd erupted in a shout that was part joy and part relief. So now it came down to one man, P. Burnham, to book N1’s place in the semis. To take the team further than they had ever gone before. And if ever there was a man made for an occasion such as this it was Burnham. A man who didn’t so much seek the limelight as demanded it. While the rest of the team were biting nails and covering their faces Burnham strode forward with a confident swagger, winked to the camera and buried the ball in the back of the net. A split second later he was besieged by his grateful teammates, led by his captain Mawhinney. One of the giants of the tournament had been conquered and now anything seemed possible. But while the crowd could celebrate and start to party the team still had a job to do. They were facing a team from the co-organisers, Hackney Ambassadors, and Ambassadors weren’t there to just play a walk on-walk off part. And for one of the younger members of the team, Pike, the sense of euphoria got the better off him. His dancing antics showed he was thinking more of playing to the crowd than playing the match. But luckily a few older and wiser heads in the N1 team soon bought the youngster into line – for them this might be their last chance of glory and they weren’t going to let it slip through their fingers. As you might expect the semi was a cagey affair with both teams sitting back and sizing each other up in the initial stages. There was little in the way of clear cut chances in the opening exchanges and it looked like this might be an anti-climax after the events of the quarters. Then Ambassador’s captain, Brown, started to impose his authority on the match. 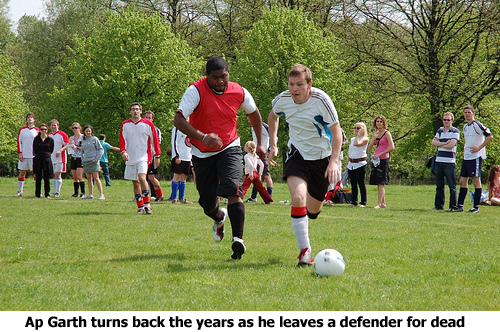 Striding forward from defence he added his height and weight to attack and proved himself a real handful. Sensing the danger Invaders switched tactics to double up on this giant of a man to snuff out the danger. It took the tracking back of Garnham and Burnham, it took a double block from Mawhinney and it took a diving save from Blackmore but Brown’s route to goal was thwarted each time. And then in the dying seconds it came. The chance. A great through ball had found Phillimore in space up front. He had shaken off his marker and homed in on Ambassador’s goal. Could this be it? Could N1 book their place at the high table? He did everything right from his movement, his position, his first touch, his rounding off the keeper and his shot which he stroked into the corner. The crowd drew breath, ready to cheer the outcome. But then disaster! The shot struck the post and rebounded away. Phillimore shook his head and wondered what more he could have done, to which the answer was nothing.As the final whistle sounded and the crowds expectant cheer turned into an agonising groan, Invaders had to prepare themselves for penalties once more. During the shoot-out the advantage switched from one side and then to the other and it looked like nothing would separate these two teams. 5 penalties in and still it was honours even. But on the sixth penalty Blackmore booked his place in Invaders’ folklore and his team’s place in the final. 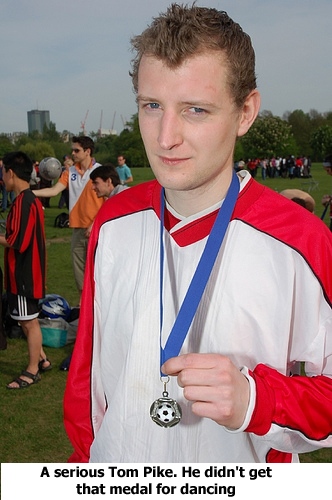 He showed his agility by saving Ambassador’s 6th spot-kick and then calmly slotted home from 7 yards to ensure the fans would be singing his name as they made their way to the Wembley of Regent’s Park – Pitch 2. Savour those words as you read them because many thought they would never see them in print. 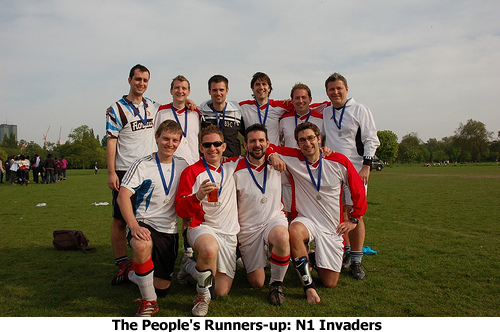 Whatever happened now Invaders had shown that they were at least the equal of some of the best teams in London. The final was never going to be an irrelevance but the real glory lay not so much in the result but in the fact that they had got there. The fans enjoyed the occasion and sang like they never had sang before. Their team played with a sense of pride, belief and grit that showed how much they had grown throughout the tournament. There was the time when they may have won it when Burnham had a half-chance in the second half. 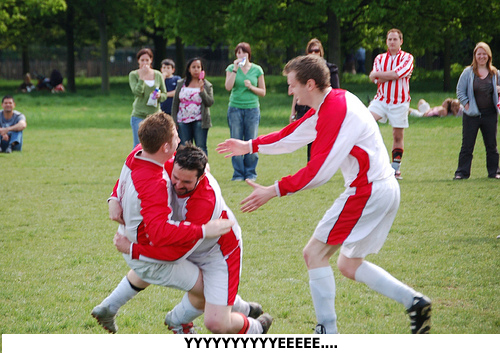 There was the time when they may have lost it when Pike had to clear off his line with his knee. But it was not to be. The lottery of penalties played out is course and this time fortune did not favour Invaders. But as the name of the winners, Selhurst Evangelical Church, rang around the PA system the CotC fans rose to salute their new heroes. 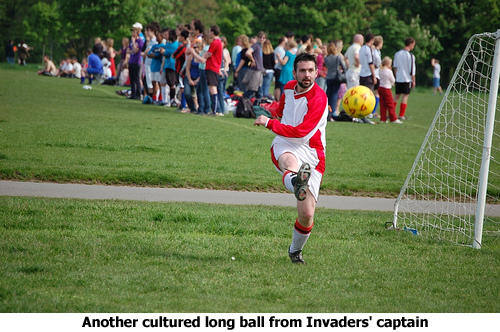 Invaders may not have beaten the whole of London but they had won over a corner of Islington. They had competed until the very last kick of the day, they had stood toe to toe with some great sides and not been found wanting. Invaders could walk away with their heads held high. To return to the Football main page click here.